Hyperlinks can be added to the hint portion of a question so they can be clicked on within the app. 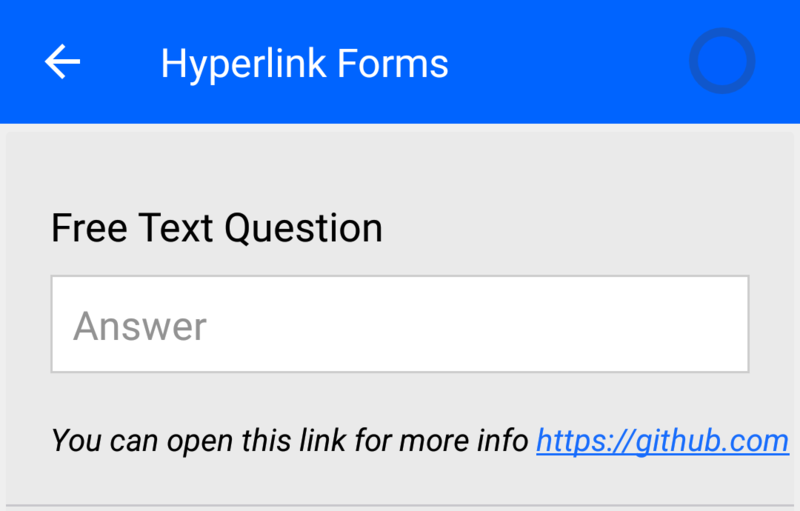 If you need your team to be able to access certain information via the web while they are out in the field, it's possible to include hyperlinks in the hint portion of a question within the Device Magic app (Currently only available in the Android version). To set up a hyperlink within a question you need to first edit the form in the Device Magic Form Builder. Once you navigate to the form and the question you would like to add a hyperlink to, click "Show Advanced Settings" on the question. This reveals all the additional properties of the question, including the hint option. You can then type a description and include your hyperlink. Once you have added your hyperlink, save your form. Now, when your devices refresh and update to the new version of the form the hyperlink(s) will be clickable and navigate to your default web browser (the image below shows how a link will look within the Device Magic Forms app). Once a user clicks a hyperlink they will be taken outside of the Forms app. To continue editing their form, they will need to reopen the app. A hyperlink will not work on the device if it does not have a cellular or wifi data connection. When adding the hyperlink to the hint portion of the question, add a brief description so your team understands the purpose of the link within the form. It's that easy to make sure your team has the information needed to complete forms while in the field. If you have any questions or comments feel free to send us a message at support@devicemagic.com.